Since the mid 1970s, Sound Fixing And Ranging (SOFAR) floats have been used to measure and track oceanic currents. These floats send out acoustic pulses, typically at 260 Hz, and moored listening stations at known locations receive the sound signals. Using time of arrival of the signal at three or more hydrophones, the position of the float can be determined. 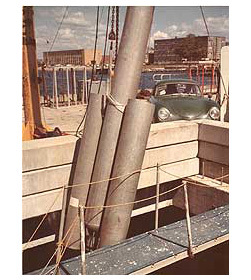 An early design of the SOFAR float- it had two resonator tubes, one to each side of a center flotation tube. Courtesy of the RAFOS Float Group at the University of Rhode Island. SOFAR floats work at ranges of up to 2500 km, which is about half way across the Atlantic Ocean! An average vessel can deploy around 20-30 floats at a time. The problem with these floats is that they are relatively expensive to deploy and use. Reversing this technique, scientists created the RAFOS float, a less expensive and more efficient oceanic current tracking instrument.